Weight all helium-filled foil balloons. Tie all ribbons to the weight so if they are released they will float away individually. DO NOT tie ribbons together before attaching to weight. Tie them to the weight with one knot. Do not use metallic ribbon with helium-filled balloons. CALIFORNIA LAW REQUIRES THAT STEPS BE TAKEN TO PROTECT ELECTRICAL POWER LINES FROM DAMAGE BY FOIL BALLOONS AND OTHER METALLIC BALLOON-RELATED ACCESSORIES. THE FOLLOWING STATES THE PENAL CODE THAT DETAILS THE EXACT WORDING OF THE LAW. Affixing an object of sufficient weight to the balloon or its appurtenance to counter the lift capability of the balloon. Affixing a statement on the balloon, or ensuring that a statement is so affixed, that warns the consumer about the risk if the balloon comes in contact with electrical power lines. A printed identification of the manufacturer of the balloon. (b) No person shall sell or distribute any balloon filled with a gas lighter than air that is attached to an electrically conductive string, tether, streamer, or other electrically conductive appurtenance. 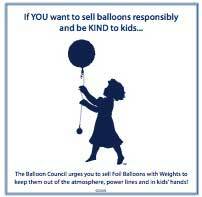 (c) No person shall sell or distribute any balloon that is constructed of electrically conductive material and filled with a gas lighter than air and that is attached to another balloon constructed of electrically conductive material and filled with a gas lighter than air. (d) No person or group shall release, outdoors, balloons made of electrically conductive material and filled with a gas lighter than air, as part of a public or civic event, promotional activity, or product advertisement. (e) Any person who violates subdivision (a), (b), (c) , or (d) shall be guilty of an infraction punishable by a fine not exceeding one hundred dollars ($100.00). Any person who violates subdivision (a), (b), (c), or (d) who has been previously convicted twice of violating subdivision (a), (b), (c), or (d) shall be guilty of a misdemeanor. (f) This section shall not apply to manned hot air balloons, or to balloons used in governmental or scientific research projects.